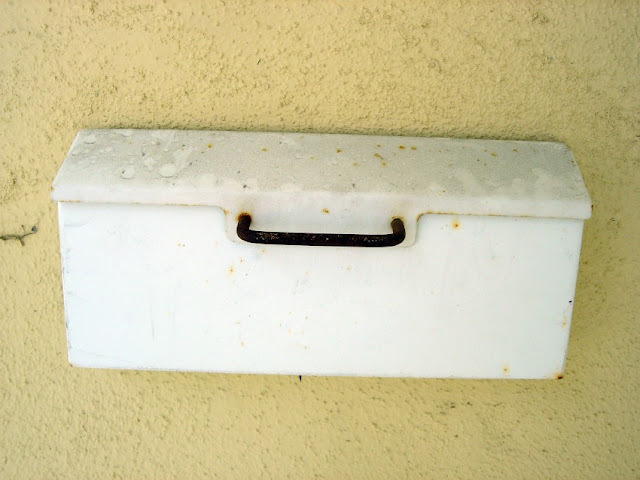 California Livin Home: Mailbox Makeover - It's a Shore thing! The weekend is finally here. I usually get in my "weekend" mode on Friday's. My mind is always clicking along at light speed wondering, thinking and planning on where I want to go or what I want to conquer around the house this weekend. My planning started earlier in the week while shopping. I had been contemplating what to do with our dirty little rusty mailbox that came with the house when we purchased it but had yet to get to it or buy a new one. I had a thought what I was thinking about doing but needed some supplies to do so. So while out Tuesday at my favorite fabric haunts I stumbled (okay drove directly to) a great home store in Costa Mesa called TPT Home. Looking around I came upon what I needed for my mailbox makeover.....a bag of Shells! How pretty was that going to be? Well you decide below. I have posted several pics of before, during and after the makeover. I absolutely adore it and I hope the mailman does too. I applied the shells with a hot glue gun. No pattern "anything goes"! After applying most of the shells I took jute string and wrapped it around the handle, gluing it at each end and in intervals to keep the jute taunt. Ta-Da! All done. I absolutely adore it!!! Is it too pretty to get bills??? One can hope ~ LOL!